Yotam Ottolenghi is a very famous chef in today’s world. Some of his recipes are often found on the Guardian website under “life and style“. We enjoyed this salad a lot. The dressing is very nice especially using lime. Kohlrabi is one of our favorite vegetables, and we have a lot growing in our garden. We look forward to having this nice crunchy salad more often. 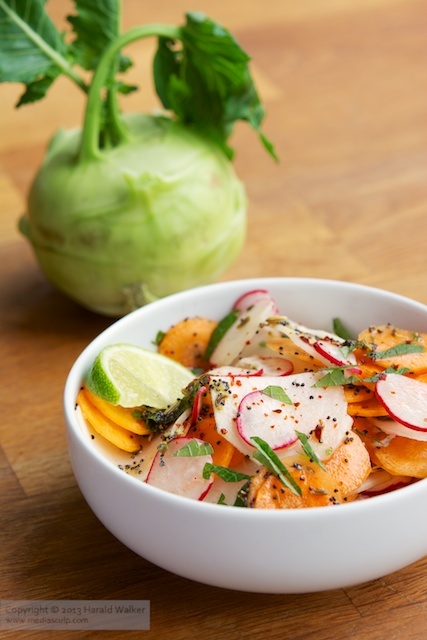 Posted by Chris Walker on June 30, 2013 in Carrot, Kohlrabi, Radish, Reviews.